"This isn't your grandma's journalism"
COLUMBIA, Mo 02/25/15 (Feature) -- Two Columbia educators are calling for major reforms in journalism training, the city's signature education offering. Published by the Knight and Nieman Foundations, their findings probe a troubling trend for a college town that has staked its future on students, many of whom study at the Missouri School of Journalism and Reynolds Journalism Institute. In 2014, "enrollments were down at some of the most prestigious programs in the country -- for the second year in a row," Stephens College president Dianne Lynch writes in a Chronicle of Higher Education article about her study, Above and Beyond: Looking at the Future of Journalism Education. "Journalism education, mired in the systems and structures of higher education, is not keeping pace with an industry changing at Internet speed." An Online News Association founder who directed the first national look at online news credibility, Lynch "calls for universities to make profound changes," Knight Foundation communications vice president Andrew Sherry explains. Katherine Reed's October report for the Nieman Foundation offers similar guidance. "It’ll take a new generation of academic leadership to break through the old ways we train journalists," writes Reed, a Missouri School of Journalism professor and Columbia Missourian editor. "We need a thoughtful and fearless discussion." Reflecting Lynch's concerns, Reed says reforms will have to overcome "barriers built into the structure of academic institutions" that involve "sensitive issues" like tenure, autonomy, and independence. Both reports urge journalism schools to, as Reed says, "teach new subjects and skills." Those skills, Lynch argues, are "digital-first". They stress tools -- from social media to online video -- print publications and J-schools have struggled to master. "As the news-and-information ecosystem morphs to digital first, many of the nation’s most prestigious programs are scrambling to keep pace," Lynch explains. "We have played almost no part in the transition" from print to digital, Medill Journalism School dean Bradley Hamm told her. Bringing "digital first" instruction to the classroom means "learning by doing," both Reed and Lynch claim. "When Walter Williams created the School of Journalism here in 1908, he was pretty clear about one thing: He didn’t think you could learn journalism without doing it," Reed explains. She likens Williams' model -- aka The Missouri Method -- to its medical school counterpart, the "teaching hospital." Lynch insists today's teaching newsroom incorporate "the digital-first startup." Think BuzzFeed, the Huffington Post -- and the Columbia Heart Beat, which has evolved without a print counterpart across several digital platforms: email, listservs, blogs, and now a complex software program called Joomla. Only a handful of journalism schools emphasize digital-first instruction, a backward oddity this far into the "digital revolution" that heralded the Internet two decades ago. "Even today, there exist no campus-based journalism education equivalents to digital-native upstarts transforming the professional media landscape," Lynch laments. Reed asks J-School faculty, "Are you moving toward a truly converged curriculum?" "Convergence" is a fancy term for high-tech, digital media, and Reed says the answer is generally NO -- a troubling situation. "If you are a journalism educator or media professional, I have news for you: We work in tech," notes Texas State University professor Cindy Royal. "Internet and web technologies don’t just represent a new medium where print and multimedia can live in harmony. The ways we communicate both personally and professionally have been profoundly altered." Her 6-part Knight Foundation study "started with educators," Lynch explains. Through two journalism education groups, Lynch distributed a survey asking, "What skills will a journalist need by 2025? What should journalism education teach?" "The response was disappointing," she explains. Only 20 educators completed the survey. Turning to interviews with professors, professionals, entrepreneurs, recent grads, and students, Lynch found a common theme: "Journalists are no longer simply writers and editors; they’re technologists, entrepreneurs, data analysts, and community mobilizers." But how to merge all those roles? Teach "core skills -- reporting, editing, web production, mobile journalism, and audience engagement" -- applicable to any platform -- magazines, websites, mobile apps, TV news -- Reed suggests. Easier said than done. Taking her advice would mean "eliminating [non-core] faculty positions, blowing up structures, and upsetting students," she says. 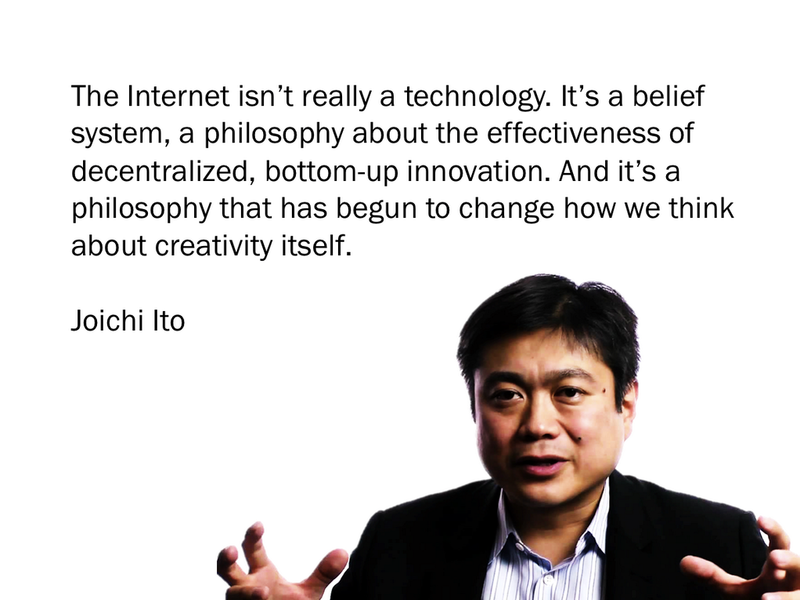 But that's just what journalism needs, says MIT Media Lab director Joichi Ito. J-schools are like print newspapers: too traditional, he told Lynch. Experimentation, innovation -- that's where it's at. "But like any academic discipline, journalism programs are challenged by the tenure system," Ito says. Old faculty must retire before new faculty can inspire. "More and more of the really interesting journalists aren’t coming from J-schools," Ito adds. Then he drops a gulp-inspiring bomb for this town of 10,000 new student apartments. "You have to ask, 'Do we need J-schools?'" Yes, both Reed and Lynch insist. But to keep student enrollments up and journalism relevant, we also need -- you guessed it -- "superheroes". "Cue a caped journalism education crusader willing to incur the wrath of faculty, the university, alumni, industry, and analysts," Reed says. "That's what it will take. "This isn’t your grandma’s journalism."